It is fitting that we should enjoy ourselves on the Memorial Day weekend. Many have fought, died, were injured for our right to enjoy life in the United States of America. So, have your picnics and cook-outs. Enjoy fishing, surfing, kayaking, swimming, beaching in all its forms. Just remember to keep in mind the reasons you can do these things. On Monday, Memorial Day, there will be several events that celebrate those who served and those who serve. You might want to check them out. The Southport Memorial Day Parade will begin at 10:30 AM in Southport, NC. You will be able to view it on Howe St. between Lord Street and Leonard Street and on Leonard Street to the John N. Smith Cemetery. Following the parade, at the cemetery at about 11 AM, Reverend Reginald Simmons will speak at the American Legion Post 213 Memorial Day program. At 2 PM, there will be a ‘Days of Remembrance’ program at the Southport Community Building with speaker Howie Franklin, former Air force One flight steward. This event will be hosted by the Junior Women’s Club of Southport, NC and will finish with an ice cream and apple pie social. On Saturday and Sunday, art lovers might want to make their way to Bald Head Island, NC. The Smith Island Art league will hold their annual Memorial Day Show at the Association Center next to the Village Chapel of Bald Head Island. Guard Station-Oak Island-Annual Safety Expo in Caswell Beach, NC. Here you can learn about the ways the US Coast Guard is keeping us safe while, at the same time, enjoy exploring all the kinds of safety equipment used in their operations and the safety operations of the area. It looks like we have a beautiful weekend coming up in Brunswick County, NC, and there are some fun events coming up as well. On Saturday, you can take part in, not one, but two, Spring Flings. The first, Spring Fling at the Lakes, will take place in Boiling Spring Lakes, NC beginning at 11 Am. This event will be fun for the whole family and will continue until 4 PM. The second, actually a ‘Spring Swing,’ is an event sponsored by the Yacht Basin Provision Company, in Southport, NC, and is held there every year. It is an event that is looked forward to with anticipation by those who have participated in the past. With music by the Andrew Thielen Big Band Show, this event begins at 6:30 PM, is not to be missed if you love music and dancing. There will also be food, drinks and camaraderie with friends available. If you have a passion for clean oceans and renewable energy, you may want to take part in the Hands Across the Sand event on Saturday. You can meet like minded people at the Oak Island, NC cabana (4603 E. Beach Dr.) at 11:4 AM and join hands at 12 noon to protest drilling for oil and seismic airgun testing in the ocean. Also on Saturday, at the Museum of Coastal Carolina in Ocean Isle Beach, NC, you can enjoy a sea turtle program beginning at 11 AM. This program, presented by the island coordinators of the Ocean Isle Beach Sea Turtle Protection Organization, will be a presentation of the life cycle of the sea turtles who lay their eggs on the beaches of Brunswick County, NC. On Saturday and Sunday, Ocean Crest Pier in Oak Island, NC, will be a busy place. This weekend is the weekend of the Rebel King Mackerel Tournament which takes place there each year. If you are a fisherman and will not be taking part in this event, you might want to consider surf fishing or fishing from a boat this weekend. No matter what your relationship with your mother, we all have one. We all owe our lives to our mothers – none of us would be here without them. So, each year a day is set aside to honor mothers and this year that day is Sunday. There are so many ways we can show our appreciation and I think, if at all possible, the most important is to spend time with your mother. The gift of your presence would mean more to her than flowers, cards, a meal, candy – any of the traditional kinds of gifts. That said, however, you might want to think about showing up with some yummy goodies from one of our local bakeries. In Southport, NC, you will find sweet treats at Burney’s Bakery and The Confectionary. In Shallotte, NC, you can feed her sweet tooth at Sugar Confections Bakery. In Ocean Isle Beach, NC, check out Seaside Bakery. In Calabash, NC, the place for sweets is Maude’s Country Delights. 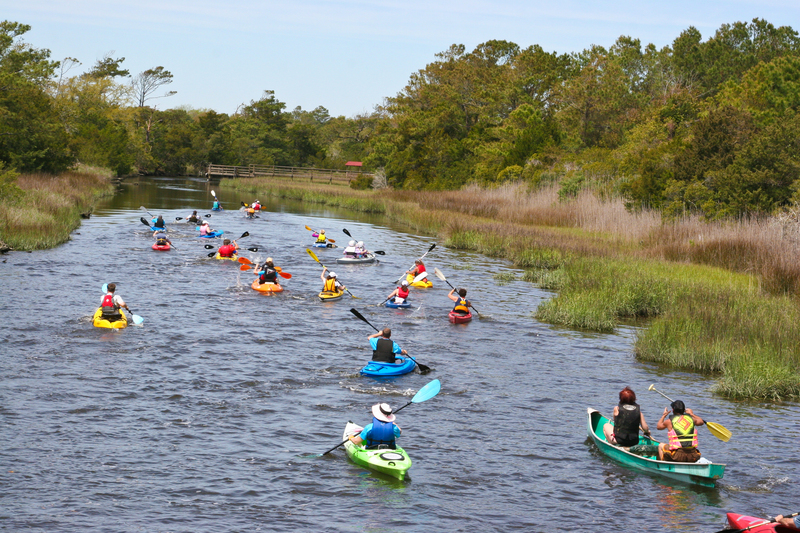 On Saturday, you can Ride the Tide in the Davis Canal in Oak Island, NC. If you have a mom who likes kayaking you can take her as well. The more the merrier. What a beautiful and fun way to spend the day outdoors and take advantage of the natural blessings of North Carolina. If Kayaking is not your thing, or your mom’s, if music is your preference, that is on offer as well. The Brunswick Concert Band Spring Concert will take place on Saturday at 3 PM at the Brunswick Community College Odell Williamson Auditorium in Bolivia, NC, with some foot tapping and beautiful music. Those of us who are blessed with good health often fail to appreciate it. We st take it for granted. However, many of us have family and friends who are struggling to maintain some semblance of normalcy in life because of their health problems. This struggle often takes place in solitude, behind closed doors. On Friday and Saturday, this weekend in Shallotte, NC, you have the opportunity to encourage and support these individuals in their struggles at the Relay for Life of Brunswick County event held at the West Brunswick High School. Be there. On Saturday, in Southport, NC, classic car enthusiasts can enjoy the Annual Classic Car & Truck Show sponsored by the Cape Fear Cruisers. This show is held in the WalMart Shopping Center parking lot, making it convenient to your weekend shopping as well. In the mood for music on a Saturday afternoon? Head on down to the Ocean Isle Beach Park Amphitheater in Ocean Isle Beach, NC for the Brunswick Concert Band Spring Concert. There, you can spend the afternoon in the open air listening to marches, melodies and moods. Also in Ocean Isle Beach, NC, starting on Saturday and running throughout the week will be the Far Out Shoot Out Fishing Tournament hosted by the Ocean Isle Fishing Center. You can take part if you like, but even if you don’t, you will likely see lots of fishing craft on the sea next week.